Custom Kit Modular system is Sidchrome's first fully Customisable Modular Tool Kit System. The Sidchrome Custom Kit System lets you get more personalized, more organized and more portable. 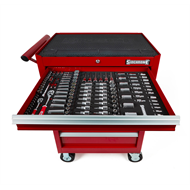 Each Custom Kit Module is supplied in a precision machined EVA foam storage tray that is designed specially to fit Sidchrome's heavy duty tool chests and blow mould case. 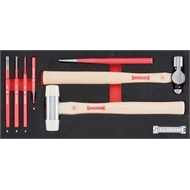 This 7 piece heavy duty metal working set features a selection of precision crafted tools. Including an 8oz ball-pein hammer with hickory handle, Nyon-tipped mallet with zinc plated steelalloy head and hickory handle, 4 precision punches and heat treated 25mm cold chisel with a constant profile. 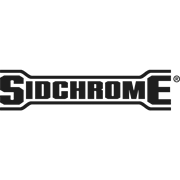 All Sidchrome Custom Kit tools are built to last a lifetime and are suitable for all users, in the workshop, at home or on the job site. This kit is ideal for metal fabrication, vehicle modification and restoration, transmission and driveline overhaul, heavy machinery servicing and repair, industrial and marine applications. Providing the flexibility to buy only the tools that you need when you need them with a variety of heavy duty storage solutions, Sidchrome Custom Kit modular system lets you build it, your way.